This example for a Yún device shows how to use the Bridge library to access the digital and analog pins on the board through REST calls. It demonstrates how you can create your own API when using REST style calls through the browser. When running this example, make sure your computer is on the same network as the Yún device. When you have have programmed the board, you can request the value on a pin, write a value to a pin, and configure a pin as an input or output. You can use the CURL command from the command line instead of a browser if you prefer. There is no circuit for this example. 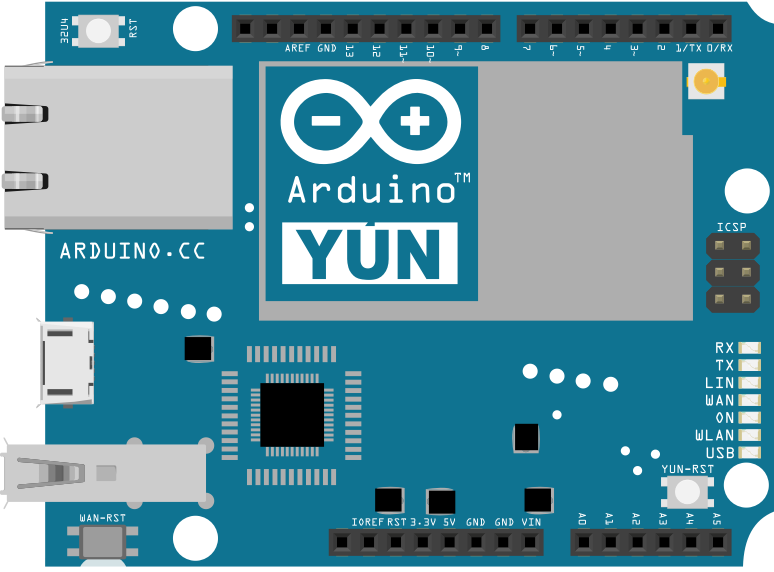 The example code shows how it is possible to make REST requests to the Yún device to read from and write information to the board's pins. Instantiate a server enabling the the Yún device to listen for connected clients. In setup(), start serial communication for debugging purposes, and turn the built-in LED on pin 13 high while Bridge begins. Bridge.begin() is blocking, and should take about 2 seconds to complete. Once Bridge starts up, turn the LED off. In the second part of setup(), tell the instance of YunServer to listen for incoming connections only coming from localhost. Connections made to Linux will be passed to the 32U4 processor for parsing and controlling the pins. This happens on port 5555. Start the server with server.begin(). In loop(), you'll create an instance of the YunClient for managing the connection. If the client connects, process the requests in a custom function (described below) and close the connection when finished. Putting a delay at the end of loop() will be helpful in keeping the processor from doing too much work. Create a function named process that accepts the YunClient as its argument. Read the command by creating a string to hold the incoming information. Parse the REST commands by their functionality (digital, analog, and mode) and pass the information to the appropriately named function. Create a function to deal with digital commands. Accept the client as the argument. Create some local variables to hold the pin and value of the command. Parse the client's request for the pin to work with using client.parseInt(). If the character after the pin is a "/", it means the URL is going to have a value of 1 or 0 following. This value will assign a value to the pin, turning it HIGH or LOW. If there is no trailing "/", read the value from the specified pin. Print the value to the client and update the datastore key with the current pin value. By wrapping the value to the client in F(), you'll be printing form the flash memory. This helps conserve space in SRAM, which is useful when dealing with long strings like URLs. The key will be the pin, and type. For example D2 will be saved for for digital pin 2. The value will be whatever value the pin is currently set to, or was read from the pin. Create one more function to handle pin mode changes. Accept the YunClient as the argument, and create a local variable to hold the pin number. Read the pin value just as you did in the digital and analog functions. If it's a valid URL, store the URL as a string. If the mode is an input or output, configure the pin and report it to client. If the string doesn't match those values, return an error. analog pins on the board through REST calls. using REST style calls through the browser. // with a value like: "/digital/13/1"
// with a value like: "/analog/5/120"
Data Logger - Log data from three analog sensors to an SD card. File Write - How to write file into the Yún filesystem. Http Client - A basic HTTP client that connects to the internet and downloads content. Http Client Console - HTTP client that connects, downloads content and shows it using WiFi and Console. Mailbox Read Message - How to read the messages queue, called Mailbox, using the Bridge library. Process - How to run linux processes using an Yún. Remote Due Blink - How to upload remotely a sketch on DUE boards. Shell Commands - How to run linux shell commands using a Yún. Temperature Web Panel - How to serve data from an analog input via the Yún's built-in webserver. Time check - Gets the time from Linux via Bridge then parses out hours, minutes and seconds. WiFi Status - Prints information about the status of your wifi connection. Yún First Configuration - Easily configure your Yún device using Serial Monitor and USB port. Serial Terminal - Use the Yún's 32U4 processor as a serial terminal for the Linux side on the Yún.